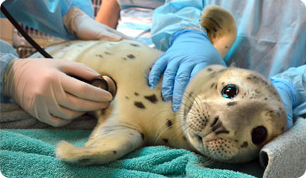 The Marine Mammal Center's Anchor Bay Operations (ABO) and Fort Bragg Operations (FBO) rescue animals along the northernmost part of our rescue range. Volunteers cover the area from Fort Ross, northern Sonoma County to the Sinkyone Wilderness, Mendocino County. As a designated wilderness area, the Sinkyone Wilderness is closed to us for rescues unless special permission is granted from the National Marine Fisheries Service and California State Parks. ABO began in 1993 when Mike and Jennie Henderson, then managers of Anchor Bay Campground in Gualala, Mendocino County began reporting many stranded marine mammals to The Marine Mammal Center. Staff and volunteers from The Center would drive three and a half hours north from Sausalito to attempt the rescue. The Henderson's reasoned it would be more efficient for local volunteers to assess and rescue the animal, and submitted a proposal to The Center. The Center gratefully accepted, and in exchange provided training and equipment. ABO evolved into two subgroups in 2004, and FBO was officially established although many volunteers had been active for several years. Currently, volunteers operate from equipment bases in Fort Bragg and Sea Ranch areas. Volunteers are always needed for animal assessment, rescue, triage, and transport. Training is provided. A minimum commitment of two hours per month, on an "on-call" basis is required. Prospective volunteers should be aware that rescues for ABO and FBO are occasional, and there may be long periods of inactivity. To volunteer, contact the Stranding department at 415.289.0184. For more information, contact ABO@tmmc.org.